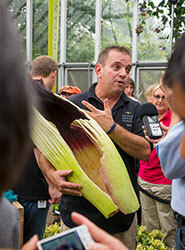 Titan arum twin Sumatra bloomed on June 1, 2017, and unleashed the most pungent stench of any corpse flower we've had—like rotting garbage. We hand-pollinated Sumatra; our blog explains the pollination strategy. The other titan arum twin, Java, one of our biggest corpse flowers ever at nearly 7 feet tall, had a glorious bloom beginning May 30, 2017, and smelled like an open-air fish market. The twins have returned to the production greenhouses to continue their life cycle. 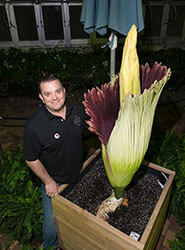 Are Java and Sumatra related to any of the other titan arums you’ve had on bloom watch? Yes, they come from the same parent plant as Sprout, who bloomed in April 2016. 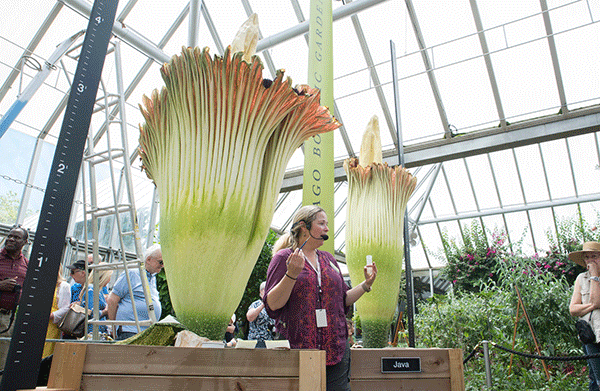 We introduced two other titan arums in 2015: Spike, who ultimately lacked the energy to bloom, and Alice the Amorphophallus, who bloomed that September. How often do these plants bloom? 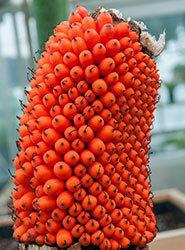 A titan arum (Amorphophallus titanum) in bloom is rare, both in the wild and in cultivation. At botanic gardens and arboreta around the world, titan arums have only recently been coaxed into bloom after ten or more years of careful cultivation. 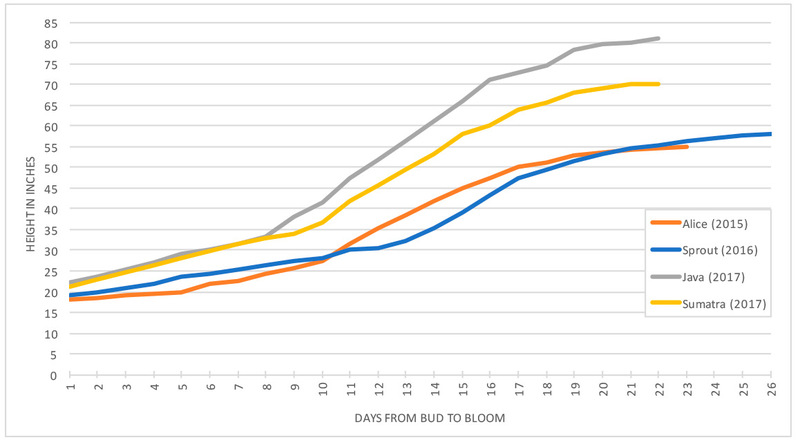 Why did the twins begin their bloom cycles at the same time? The Garden began collecting titan arums in 2003, as part of a worldwide conservation effort to preserve the species. Many of our titans were acquired at the same time, which is why the Garden has had several of them ready to bloom in a short time period. Why are the twins named Java and Sumatra? The names are meant to honor their origins. Titan arums are native to the equatorial rainforests in Sumatra, Indonesia; Java and Sumatra are both islands of Indonesia. 5/30/2017 8:28 p.m. JAVA BLOOMS 69"
Spike was the Garden’s first corpse flower to begin its bloom cycle in August 2015. 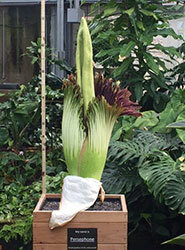 Spike ultimately lacked the energy to open—showing us just how unpredictable these plants are. Alice the Amorphophallus bloomed in September 2015. Both Spike and Alice came to the Garden from the University of California, Berkeley, in 2003. Sprout bloomed in April 2016. Sprout was germinated from a seed that was sent to the Garden from the University of California, Berkeley, in 2008. Persephone was given to Garfield Park Conservatory and bloomed there in June 2016. This titan arum also was grown from seed sent to us in 2008 from UC Berkeley.